In some ways, Volkswagen has felt like a natural competitor against Honda for generations. It all started when the Volkswagen Golf, or Rabbit, began to make waves as an affordable and fun-to-drive car. The Civic at this time was a similar hatchback option. Fast forward to today and those models have taken their own individual paths in the market, but the 2018 Volkswagen Passat remains a direct head-to-head competitor vs the 2018 Honda Accord. Which midsize model is likely to hold your interest? These days it’s not quite as easy as it might seem to compare vehicles because options vary wildly. Which model is better for you might depend on different engine options or style selections. How is the Passat different from the Accord? Aesthetically, you can see that the Passat and Accord have very different looks. While the Passat sticks with a more regal and sophisticated appearance, the Honda Accord attempts an aggressive stance not frequently seen for the midsize segment. 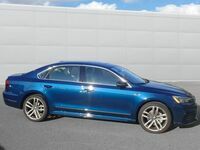 This isn’t to say that there aren’t sportier options within the Passat lineup, as both the R-Line and the V6 GT offer stylish appearance packages. One distinct area in which the Honda Accord and Passat divide is in engine options. To start, the Passat has a 2.0-liter turbo four and the Honda Accord has a 1.5-liter turbo four. The Accord also has 2.0T and hybrid powertrain options, while the Passat jumps straight to an available V6. Another major mechanical difference comes in the transmission options. The vast majority of the 2018 Honda Accord trims com paired with the continuously variable transmission, or CVT. VW, knowing that this is an unpopular choice with many drivers has not opted to include this on models, even if it does boost fuel economy numbers. It’s simply not a favorite for many motorists. The Honda Accord does offer a 10-speed automatic for those who upgrade to the 2.0-liter engine, but with the model already outpacing the Passat in price, this means an expensive upgrade. Are you curious if you’ll fall in love with the 2018 Volkswagen Passat? There’s no need to keep dreaming. Stop by Dirito Brothers Volkswagen for a test drive.